The 2018-2019 Vital Signs is an internal publication for faculty and staff. This edition of our fact book serves as a reference for key indicators in admissions, enrollment, retention rates, graduation rates, degrees awarded and post-graduation outcomes, finance, financial aid, human resources, and advancement. Note: You will need a Wheaton College faculty or staff email account to access this publication. Institutional Research collects data on the employment and graduate school activities of our recent graduates. For the last few years over 95% of graduates report being engaged in professional activities within six months of graduation. Note: You will need a Wheaton College faculty email account to access these reports. Reports are produced for each academic major. Institutional Research provides newly created course enrollment reports. Included are a breakdown of majors vs. non-majors taking courses and a numbers enrolled in each course for the last 10 academic years. The number of students taking each course is totaled across sections and semesters to derive the total for each academic year. Nearly 50 subject reports are available. Note: You will need a Wheaton College faculty email account to access this publication. Wheaton College Common Data Set (2018-2019). 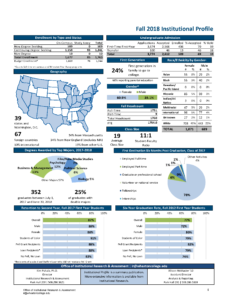 Provides a single page reference of key indicators of admissions, enrollment, retention rates, graduation rates, degrees awarded and post-graduation outcomes. 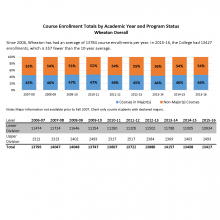 The National Center for Education Statistics at the U.S. Department of Education provides a profile of Wheaton College with additional information.